Being cooped up in the house can drive Kien spare, and so this weekend I wanted to make sure we were enjoying the outdoors as much as possible. Even a stroll up the road through Ponsonby was considered a fun outing! The Child Cancer Foundation Research collectors were out in full force along Ponsonby Rd, and they appreciated our generosity (I read about Lea and her family and feel compelled) by giving Kien plenty of stickers which delighted him immensely. Whenever we go in the stroller now he will only stay seated for so long, especially when there are acorns to chase. He would throw the acorn, then chase it bouncing down the footpath, and pick it up and throw it again. He picked this particular acorn up from the top of Franklin Road. He rolled it all the way to Three Lamps and then put it into his pocket for safe keeping. By the way, we have a small container of acorns he has collected and brought home. He likes to make friends with all the animals he sees on the way. I didn't get a picture of the cat that he was very interested in at the park outside the library where we stopped for lunch. At the duck pond - continued. I was in the middle of writing my previous post during lunch time before being distracted by meetings, and when I was getting ready to go home I accidentally hit "Publish Post" instead of "Save". So here's the rest of the post. There was a giant chicken running around the park area near the playground, and Kien tried desperately to make friends with it. One of the ladies at his daycare own chickens and bring them in once a week, so he is familiar with petting chickens. He tried the stealth approach, and when that didn't work he just launched into full blown chasing. I brought a few slices of Vogels bread from the fridge for Kien to feed the ducks, but instead he decided it was just too yummy to give up so ate some of the bread instead. As we walked back to the car through the zoo carpark there was a beautiful patch of Marigolds on the verge. Kien could resist and insisted on playing with the pretty blooms. The lack of blog entries this past week would explain my pre-occupation with other stuff that is going on at the moment - all good stuff, like music, my guitar, researching wide angle camera lenses, techniques, creating photo books - that sort of stuff. I kind of feel like a woman on a mission of inspiration, a kid in a candy store with all my senses hightened. I haven't been this excited about my various hobbies in a long time, and it is a superb feeling (although exhausting since I sleep less as a result of wanting to achieve so much in a day). I had to decline a job with Plunket Head Office who contacted me last week asking if I would consider being their events photographer for all regional car seat checking appearances. I contemplated the proposal for a couple of days, but in the end my decision came down my available time with Jef and Kien (and whatever left over for myself). On Sunday afternoon I took Kien to the pond at Western Springs. It was a gorgeous Autumn day despite the wind. Kien had a great time as he watched the ducks and the swans paddling around. Linking up with the poetry for Lyrical Sunday - yes, I know what day it is today! Firstly, I've been secretly masquerading as a Social Media Coordinator for Ponsonby and Herne Bay Plunket. A couple of my coffee group girls roped me into it, and since I've got so much free time on my hands (I wish!) why not volunteer for the local Plunket committee?!? I have incongruous feelings about this role (which no doubt I'll write about later), but anyway, I'll try it on for size and see how it pans out. Check out the new site I created for them. On Saturday we went to the Plunket Easter Party held at the Ponsonby community center - the same place where I take Kien for playgroup on Tuesdays. We had 2 big bouncy castles set up outside. 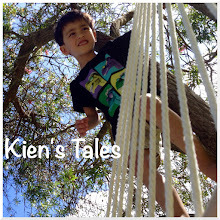 If you haven't guessed by now Kien loves loves loves to bounce. He wasn't great at sharing the bouncy castle though, and whenever a child would climb in he would tell him/her to get out. He's two, that's what two year olds are like. We had the Easter Bunny show up, and a lot of the kids were frightened and cried. I asked Kien if he wanted to go and get an egg, and he walked up to it tentatively, then turned around and came back to me and said "I'm scared". Awww, my little talker - I'm so glad he can express himself so clearly. As I was busy photographing the other kids with the giant bunny Kien managed to unwrap and eat an entire chocolate egg. First time ever that he's eaten that much chocolate. He sat there looking deliriously happy afterwards covered in melted chocolate. Once he was all washed up and clean again he ran around with one of his pals from our coffee group. It was a fun morning, and Jef was such a good sport for staying for as long as he did and looking after Kien while I did my "volunteer" thing. On Sunday Kien spent the morning helping his dad fix and build things in the workshop. Boys just have to be boys! I was planning on taking Kien to the free Tim Finn concert at Three Kings reserve in the afternoon, but with Kien not napping (again) and the wind picking up and the grey billowing clouds hovering in sky getting ready to burst - well it just didn't seem conducive to a fun picnic in the sun listening to music. So I decided to go and visit my friend Linda instead. Her son, Flynn, really enjoys Kien's company, and vice versa. They spent the afternoon playing with Legos, bouncing on the trampoline, shooting water guns, crashing toy cars, and chasing each other around - in between dinner and snacks. Then we chucked them into the bath for a good soaking. They were in there for such a long time; playing with the toys and splashing each other. They look so sweet in the bath together. Last Tuesday we had absolutely stunning weather, and when this happens I just want to go and have a picnic somewhere. We met the clan in Cornwall park, and Kien got to enjoy his cousin Thomas' company. ...played with Kien's bike - well, Kien played with Kien's bike, and Thomas only got a turn when Kien wasn't interested (until he saw Thomas being interested and it was all on again). Surprisingly Thomas didn't mind and was just happy to run after Kien. We do, we change. We don't realise it until one day we wake up, turn over and remember that, yes, it is a different time, a different place, and indeed we are not the reckless person we were once. I look back at photos of myself when I first got together with Jef over 7 years ago, and although I (obviously) recognise the face smiling at the camera I also remember how I felt at the time when the pictures were snapped, and it feels somewhat foreign to me now. Who was she? Who was this crazy girl? Actually, she wasn't that much different to the person I see now, only back then she was muddled up. She was still trying to find the meaning of life, and she really did think there was such a thing that could be found. She thought if she looked hard enough the answer would be there, and then she would be happy. She searched for it at the bottom of bottles, inside Fluoxetine capsules, through pages of Shakespearean text (especially the renowned Hamlet soliloquy), behind closed doors of psychotherapy sessions where the psychiatrists needed as much help as the patient talking to them. People around her thought she had it together. She was good at that. She looked good behind the shield, the mask that says "I feel great today" and then takes another drag of her cigarette and chugs down yet another energy drink. The only thing she nurtured back then were cats she met on streets, because there was no way she was capable of looking after anything/anyone else. I was just a girl back then; a child playing dress-up in an adult's body pretending to be a grown-up. Now I've metamorphosed into a woman, a mother, a caring partner. We change, we really do. Inspired by this post for Lyrical Sunday.